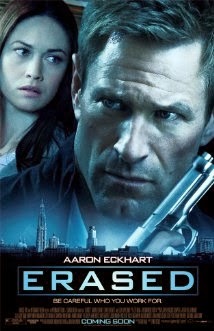 Erased is a 2012 espionage film that (spoiler alert) follows a father and daughter as they escape an endless supply of assassins and unravel the father's sins. The film was released straight to Video-On-Demand to mediocre reviews. One of my hobbies is deconstructing films to figure out where they went right or wrong. In the case of Erased, the film goes wrong with the opening scene, a bloody take-no-prisoners heist where a solo gunman shoots his way into a vault, finds exactly the safety-deposit-canister he wants and makes a clean escape. Only later do we find out this is a CIA Black Vault. The thief's escape is far more interesting than the break in, which assaults the viewers with no background and no technical detail. From the first sequence, the viewer's disbelief is not suspended. No doubt this was done to get the viewer's attention, which can work - see A Fish Called Wanda's opening heist sequence, which is used for later comedic delivery - but Erased's story is told in such a way that the lack of heist development only adds to the disbelief later in the film. Here's the bummer, not the payoff, of the heist. It was done to retrieve evidence in a commercial maritime accident so that a multinational conglomerate can pay little to the victims' survivors and avoid being outed as an arms dealer used by the CIA. People within the CIA are complicit but not tasked by the CIA. It's all about money, right? The bloodbath that follows is simply not worth the heist and by the time a hit man is mowing down anyone in his way at a hospital, you've pretty much written the film off as ill-delivered fantasy. I found myself asking more questions as the film unfolded than actually enjoying the film. It is sometimes better to obscure the MacGuffin, as in North By Northwest, than examine a poorly constructed one. The relationship between father and daughter is a hair shy of brilliantly handled. The opening scenes between the two ring true and contemporary. The father (Ben Logan played by Aaron Eckhardt, who must still be running from the ghosts of In The Company of Men) straddles ex-tough guy who wants to be a good father very well. The daughter (Amy played by Liana Liberato) is a pitch perfect adolescent, bright but cowed by circumstances. It is only when Amy is used to reveal facts about her father that her lines become too much. But their performances were doomed from the opening heist sequence, where they were absent.